When Margery Fish wrote her book ‘Ground Cover Plants’ in the early 1960s, it quickly became a best-seller. The publisher’s blurb held out the possibility of a garden ‘attractive throughout the year with the minimum amount of effort’. This promise, coupled with Fish’s reputation and encyclopaedic plant knowledge, chimed well with the prevailing utilitarian ethos. Today, when naturalistic and prairie planting styles predominate and plant associations are the preoccupation of every gardener, the term ‘ground cover’ must be whispered softly. Its evocation of supermarket car parks or the ‘green space’ around municipal buildings holds no appeal for contemporary gardeners. But in fact, Fish’s thesis – that solid banks of a single plant not only cover the soil, conserving moisture and suppressing weeds, but also provide structure and beauty – is still pertinent today. She observes that in the wild many plants form dense colonies that extend over large areas and that this can be re-created in the garden to produce a calming respite from more exuberant plantings. In the orchard garden of Bryan’s Ground, the garden of David Wheeler & Simon Dorrell, Iris sibirica is planted in large repeated blocks. While the flowering is fleeting (but dramatic) the structure provided by the sturdy upright foliage is impressive throughout the year. At his formal garden in the Vendee, musician William Christie uses Geranium macroxxx planted in squares at the base of pleached limes. The plants anchor the limes to the ground and at the same time echo the geometry of the surrounding garden. My own garden has 3m x 3m squares of switch grass, Panicum virgatum ‘Warrior’, that provide gentle rhythmn as a relief from the froufrou planting in the rest of the garden. These are all examples of ground-cover although none of them would obviously described as such. I have heard the word ‘mono-planting’ used by a chi-chi garden designer to describe ground-cover. The point is not to get fixated on terms and styles that might be outmoded, but to understand that large plantings of a single plant are not simply serviceable, they can also be an important element in the garden’s design. 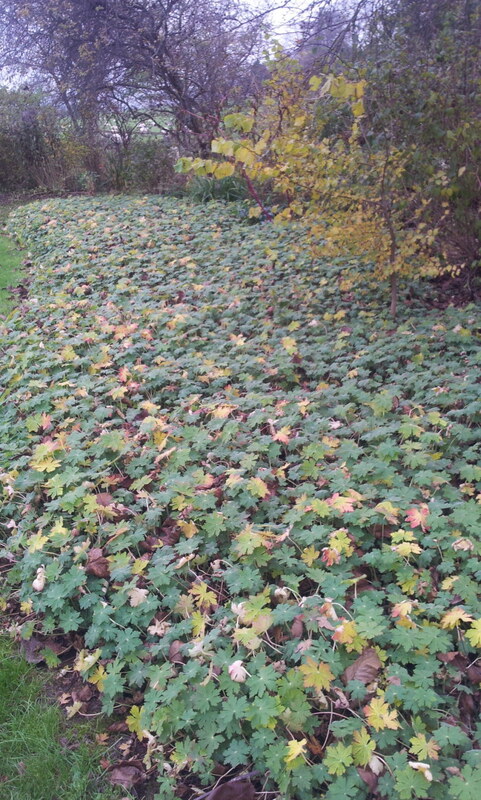 When selecting ground-cover plants it is vital to look at how the plants will spread. Cornus canadensis increases by underground shoots. Its burnished foliage and red berries may look attractive in the autumn but an established plant that is happy with its growing conditions can spread up to a metre in a season. Like most plants that spread by underground growth it is far too rampant for most gardens. Equally vigorous are those plants that spread by prostrate shoots, taking root where the stems touch the ground. Perwinkles, Vinca major, and the ivy-leaved bramble Rubus tricolor, colonise the ground in this way. Even in a very large garden they can become rampant thugs. For better-behaved plants look to those that are clump-forming and those that are slow spreading. Upright grasses, such as Panicums and Miscanthus are not traditional ground-cover plants, but they quickly develop broad crowns. A large planting, rippling and swaying in the wind is an impressive sight. The lower-growing (about 30cm tall) Hakonechloa macra has arching stems that en-masse form a soft undulating surface, like a 1970’s waterbed. Although they have extensive root-systems and run around under the surface of the soil, they are not so vigorous as to be invasive. The golden form, H. macra ‘Aureola’, is slow to spread and would need to be closely planted to achieve the same effect. Although not as elegant as Hakonechloa, Liriope muscari is a much more robust plant that has similar grass-like foliage. It will tolerate a wider range of growing conditions and has purple flower spikes in late summer. For a lower-growing plant consider Ophiopogon japonica. It, too, has grass-like leaves with the added bonus of startling blue berries in the autumn. When choosing ground-cover, consider plants that are not the usual suspects. Helleborus x hybridus are normally grown for their dazzling array of exquisite flowers. The glossy, leathery leaves that follow the flowers form a cool green carpet by early summer and stay that way until winter. If you are growing hellebores in this way, there is no point, tempting though it is, in using cultivars, for example those with delicate picotee-edged or double flowers: they will eventually be overwhelmed by the masses of vigorous seedlings the hellebores produce. The foliage of epimediums is more varied and colourful but produces a similar effect to hellebores. Use tall, large-leaved species such as E. x perralchium, E pubigerum and E x versicolor rather than the compact, short ones. Hellebores and epimediums need some shade, as does the diminutive Asarum proboscideum. The glossy arrow-shaped leaves are just a few centimetres tall and have the bonus of mouse-like flowers hidden under the foliage. Disturbing the soil around the plant will break off its little bulbils, encouraging it to spread quickly. Don’t limit yourself to plants where the foliage gives the predominant interest. Flowers lighten the density of mass-planting. The catmints (Margery Fish’s favourite was Nepeta faassenii) planted closely together give a haze of soft colour. 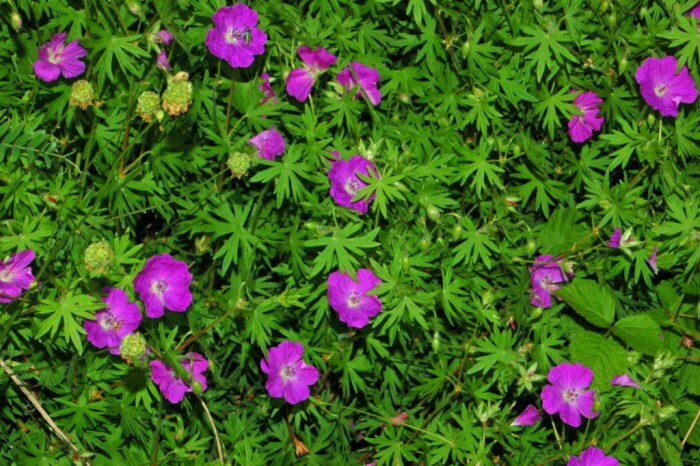 Hardy geraniums look more solid and are as floriferous. G. sanguineum spreads quickly in rich soil and has cultivars with large flowers ranging through magenta and pink to clear white. G. cantabrigiense is one of the toughest flowering plants for ground cover. In the autumn its foliage develops red and orange tints. The flowers of the evergreen shrub Sarcococca hookeriana var. humilis are tiny, but sweetly scented. The hummocks that the individual shrubs form soon merge into a dense mass. The candidates for single-planting schemes are limited only by your imagination. Experimenting with plants can produce stunning results. 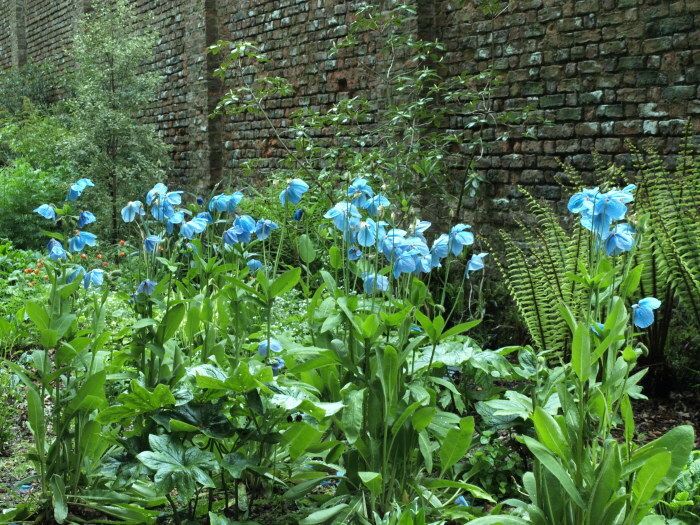 At Cally Gardens in south-west Scotland plantsman Michael Wickenden has created in his woodland a shimmering blue carpet of Himalayan poppies. Few of us have the conditions that will accommodate the demands of Meconopsis. All of us, though, have situations in the garden that will favour the mass-planting of a single plant. The effect will be dramatic – and you don’t have to call it ground-cover. Forget the myths about ‘low-maintenance planting’: little in the garden happens without hard work. It is difficult to weed between plants grown closely together, so the ground has to be well prepared before planting. The roots and rhizomes of perennial weeds need to be meticulously removed. If the area is intended for clump-forming plants, dig in well-rotted manure or compost and whatever fertiliser you prefer, to give the plants a good start. Be wary, though, of over-enriching the soil if you are planting stoloniferous or vigorous plants that could get out of control. With plants grown cheek-by-jowl, plant hygiene is important in preventing the spread of disease, so remove dead leaves regularly. Ground Cover Plants. Margery Fish. 1964. While many of the plants described by Fish have been superseded by more robust modern cultivars, the book is full of plant suggestions. She has chapters on ground-cover plants for particular situations such as banks, shady areas and damp situations and a long chapter on plants with coloured foliage. Plants for Ground-Cover. G S Thomas. 1970. Thomas’s book contains comprehensive tables of plants suitable for ground-cover, with lots of suggestions for plants not usually used for ground-cover. Perennial Ground Covers David S. MacKenzie. Timber Press 2002. An American publication aimed primarily at the landscape industry, the book is also a useful reference for gardeners. The detailed plant A-Z includes suggested planting distances needed to achieve close cover. Remember, though, that many of the plants described may not be suitable for a British climate.